Great for mid-size businesses with A3 mono needs, the Lexmark X850e VE4 MFP offers 35 ppm output speeds and an incredibly large, customisable touch screen! Take workflow efficiency to new levels. The X850e VE4 is equipped with Lexmark’s embedded Solutions Framework, offering you network-friendly, native support for Lexmark’s wide range of enterprise solutions, such as the Card for IPDS and SCS/TNe, Card for PRESCRIBE Emulation, and the Lexmark PrintCryption, Bar Code or Forms Card. 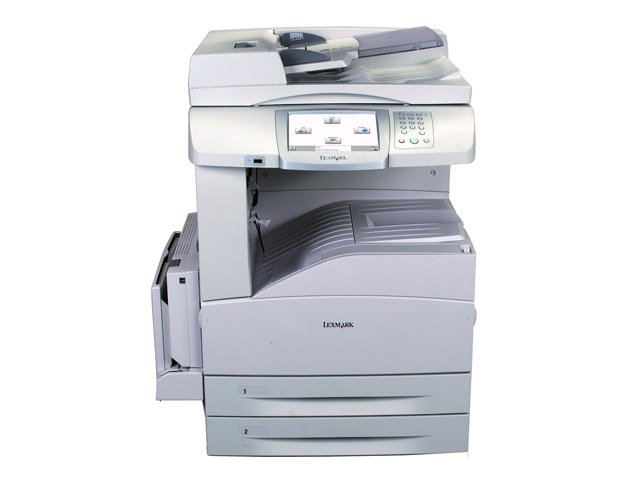 In addition to printing, faxing, scanning and copying, the X850e VE4 can be configured to best suite your business needs. Additional input options can be used to increase the already large 1,100 sheet input capacity. If no additional input is needed, a cabinet can be used to place the product at an appropriate usage height. Two types of finishers are also available from a single stapler/stacker/hole-puncher to a more advanced booklet maker. The large flatbed colour scanner is great for scanning and copying big reports. You can even preview scans on the LCD screen, or scan straight to a USB Flash drive or key. And if it’s a stack of 2-sided originals you need copied, no problem. Just place it into the 75-page Automatic Document Feeder, touch the screen and go! It doesn’t take long to see why the Lexmark X850e VE4 will be a welcome addition to your office. Its huge LCD touch screen offers a visually attractive – and extremely practical – way to access all the features you need. Intuitive and fully customisable, it’s your gateway to greater business efficiency. *Average Cartridge Yield 30,000 standard pages. Declared yield value in accordance with ISO/IEC 19752.